Having difficulties looking for high pressure check valves? We can help you because we have all sizes. Non return valves or check valves are spring loaded valves used to restrict the flow to a single direction. There is one inlet and one outlet for check valves showing the directional marking. This is to ensure that users install the check valves in correct direction wherein fluids will flow into inlet and flow out from outlet. A minimum working pressure is required in the fluids system in using check valves. Inteva series check valves are metal closing check valve applicable in hydraulic oil applications. It can withstand up to 420 Bar working pressure. There are two common connections usually used namely NPT or BSPP. High pressure check valves or non return valves are valves that allow fluids to flow in one direction only. It also mean that it is use to avoid the return of the fluids. Check valve is a two opening valve where one for fluids to enter and one for fluids to flow out. There is a directional arrow that marked on the valve body to show the valve inlet and outlet. For check valve, it will need a cracking pressure to push the poppet for fluids to flow through. For more details, please refer to inteva.es/check-valves. For Inteva series check valves, it was designed as metal closing system and made accordance to European Directive 97/23/EC. It is suitable for oil hydraulic applications in marine and offshore industry. High pressure check valve can be available in Steel (EN-10277-3) and Stainless Steel (AISI 316) material. The available sizes for high pressure check valve are ranged from 1/4" to 2". The working pressure is up to 420 Bars. 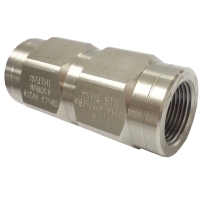 The two available connections for high pressure check valve is NPT (National Pipe Thread) and BSPP (British Standard Pipe Parallel). For more information about check valve, please refer to en.wikipedia.org/wiki/Check_valve.